Club-mate Mark was racing a criterium the other day and, looking at a photo of the race afterwards, realised he was the only one on the hoods; everyone else was in the drops. Being an insecure sheep like any dedicated road cyclist (yours truly included) he openly wondered how much of a difference it really makes? Well, I’m no engineer or data boffin. Nor do I own a wind tunnel. But I’m guessing a lower and more compact position is likely to make you more aerodynamic in the same way those ridiculous aero helmets do. Over the course of a decent length race, that might just be significant. Flip side, of course, is if you’re not used to holding a more aggressive riding position you might be bloody uncomfortable and lose any infinitesimal energy and/or time gains when the whips are cracking through uncontrollable back spasms that render you essentially immobile. Or you might just crash. 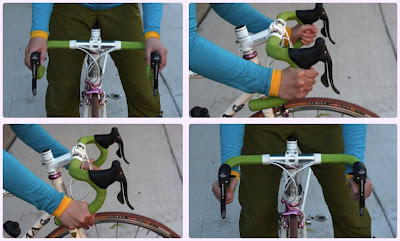 Regardless, I’ve scoured plenty of online forums on the subject in the last 24 hours and as far as I can gauge there’s no clear right or wrong way to hold your bars. Like most things bike related the best advice appears to be simply: do whatever works best for you. That might mean spending 95% of your time up on the hoods and just 5% in the drops. Or vice versa. Or, in other words Mark, keep doing things your way. For all the engineers and data boffins out there feel free to decipher this and report back. It’s all gobbledygook to me. But I think it might be relevant? Cycling Aerodynamics & CdA – A Primer : Cycling Power Lab. On the flat, at 300W, it reckons 37km/h on the hoods, and 40km/h on the drops. The difference is probably less though if you’re drafting in the middle of a peleton. Thanks mate, very interesting. 3km/h is a lot especially over some distance. Talk to any coach or seasoned racer and they will tell you that in close groups your hands should always be in the drops or if on the hoods the fingers should be extended to the drops to prevent your bars from hooking up with riders next to you. At any rate it doesn’t stop me from forgetting to do it no matter how many times it is heard. There has been lots of aero testing on this and as per the link above it all comes down to reducing your frontal area. In the drops is considerably better than sitting in the hoods, But only marginally better than on the “Horns” – hands on the drops but elbows at 90 deg head down low. This can be extended to the TT position which is the best “legal” position you can ride in a TT. When racing in tight group as Joel says, it is always good to have your hands in the drops, but more related to better control and access to brakes than worrying about handlebars hooking – elbows and head butts stop that! You should always do any hard interval work in the drops, so your body gets used to riding in that position as much as possible.